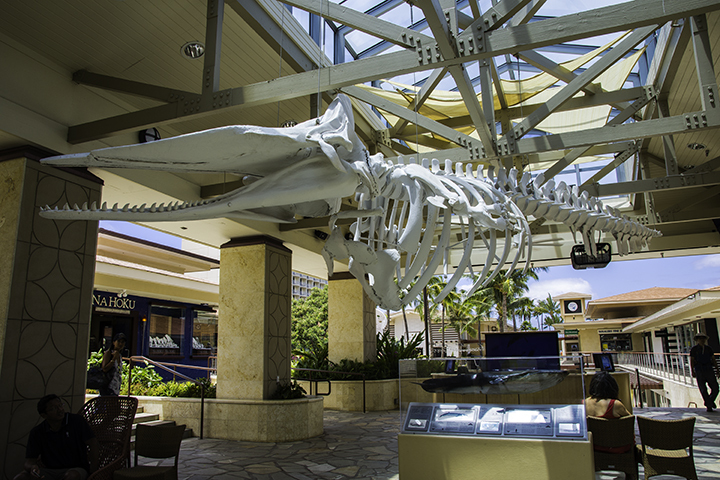 Humpback whale skeleton on display near Lahaina, Maui. Maui is home to innumerable whales in the winter season. However, the ocean around this island was not always a peaceful whale breeding area. Maui’s town of Lahaina was once the busiest whaling port in the Pacific Ocean. Here’s an overview of whaling in Lahaina and the impact it had on the Hawaiian Islands. Whaling in Lahaina started in the 1820’s when over 100 ships annually would visit this port. Captains on year-long whale hunts would rest their crews in Maui on their journeys back to America. But whaling ships would also prey on the dozens of whales passing by the waters of Lahaina. Crews would restock provisions in Lahaina and recruit new sailors. They would even romance Hawaiian women before their journey back to the mainland. Crews stayed in Lahaina for weeks on end. They were a raucous crowd partaking in long stints of drinking and prostitution. Their debauchery and gambling disturbed many Maui residents. As result, Lahaina’s prisons housed many of these troublesome miscreants. By the 1850’s nearly 400 ships annually made port in Lahaina. The busiest season on record was 1846 when a total of 734 whaling ships came through Lahaina. In just a few decades, the thriving town became the whaling capital of the world. The 19th century practices of whaling were wasteful and crude. Crews would strip whales of their bones and blubber, throwing carcasses back into the ocean to decompose. Ships hunted whales largely for the oil from extracted from boiling their blubber. People used this oil as lamp fuel, a soap additive, industrial machinery lubricant and an ingredient in margarine. The strong and relatively flexible nature of the whale bone made it a popular precursor to plastic. Whale bone and teeth were once used for items such as: chess pieces, umbrellas, piano keys and much more. Many of the whalers were not keen on Hawaiian’s primary diet of poi and fish. So enterprising Hawaiians began growing potatoes and raising cattle for beef, which they sold to sailors. During the peak of the industry, Maui increased its overall farm production to support the whaling fleet. Maui’s diverse range of farms and produce today can trace parts of its beginnings to the whaling industry. The decades of whaling in Maui slaughtered sperm and right whales numbering in the thousands. However, other factors further hastened the decline of whaling in Lahaina. The 1849 California Gold Rush motivated many crews to leave whaling for gold mining. During the American Civil War many Northern-based whaling ships were destroyed by the Confederacy. Finally the whaling industry saw its final demise when petroleum replaced whale oil as a fuel in the 1870s. By 1925, whaling ships were almost entirely obsolete. Thankfully, there is no whaling in Lahaina anymore. But visitors can still enjoy some of the most best whale watching in the world from this historic town. Every year, 6,000 to 7,000 whales journey through this former whaling port. The areas around Maui is one of the most active whale breeding grounds and calving areas. As a result, Congress established the Hawaiian Humpback Whale National Marine Sanctuary off Maui in 1992. It is the United State’s only marine mammal preserve. If you are spending a vacation in Hawaii, you will not want to miss the Whalers Village Museum in Ka’anapali. It is open daily and costs only a few dollars to visit. The museum features a life-size model of a whaling ship, ornaments, whale artifacts and other historical collections. You should definitely plan a trip to Maui during the winter season. Here, you can witness whales swimming and splashing on the ocean and gain better appreciation of these magnificent creatures.